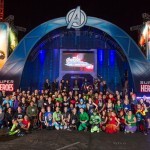 After all the fun at Wine and Dine, we boarded a plane on Wednesday to LA in preparation for the Avengers Half Marathon. For me, the timing of Avengers was perfect. 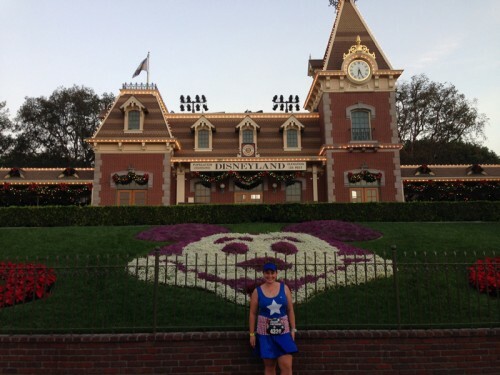 It meant I could fit in 2 runDisney races, and get my Coast to Coast in one 3 week holiday. We had decided to stay at the Paradise Pier Hotel as I was a little nervous having never been to Disneyland before about getting around without a car. Although staying onsite was quite expensive in comparison to staying onsite at Disney World, I found the benefits of being able to walk everywhere to outweigh the cost factor (especially because it was our first time there). 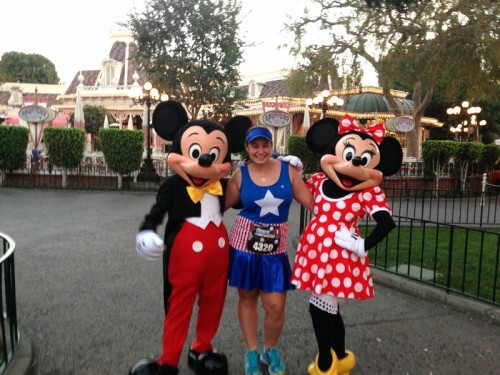 If we were to visit again I would probably choose to stay offsite, unless I was planning on doing a multi-day runDisney race with a few early mornings. The expo was held at Disneyland Hotel, and I heard rumors that the Disneyland expos can get quite hectic, so even though the expo wasn’t scheduled to open until 10, my boyfriend and I went over at about 9 to get in line. THANK GOODNESS WE DID! There were a few different (long) lines- official merchandise, packet pick up, volunteers and Dooney and Bourke (I think). All the lines were set up in a downstairs area of the Disneyland Hotel- I want to say a carpark, but don’t quote me on that one. I originally got into the packet pickup line before my lovely boyfriend pointed out the long official merchandise line, so we made the very smart decision to move lines. We waited in line until about 9:40, when the line began moving into the expo area upstairs, and by about 10:15 we were in the merchandise area. I had seen quite a few cute items posted on Facebook and Twitter, so first on the list was an ‘I smashed the Half’ Hulk tech shirt. 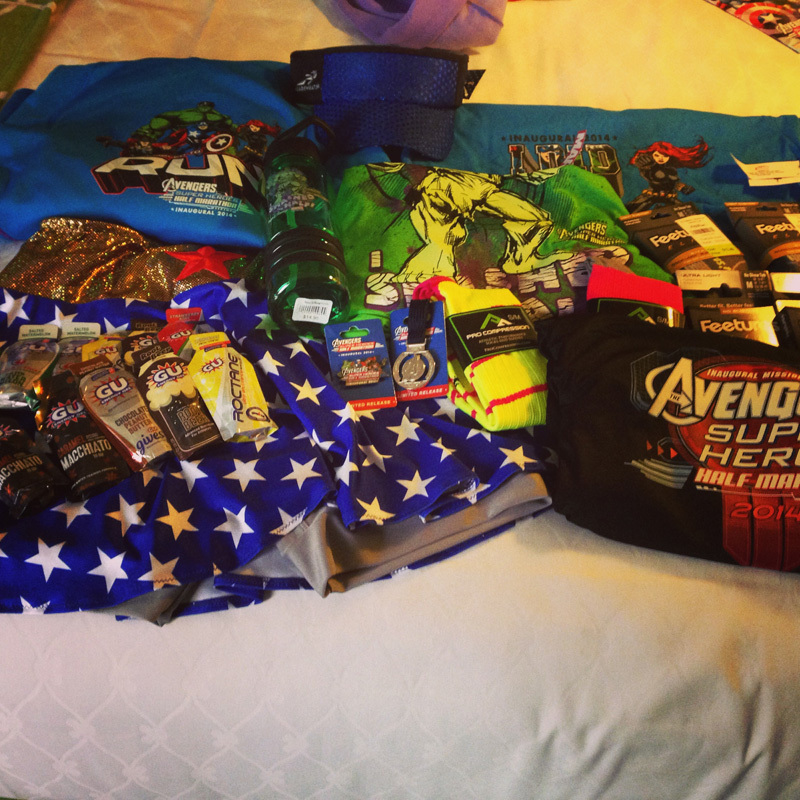 I also picked up a few other bit and pieces- a hoodie, drink bottle, I did it shirt and a medal pin. My expo haul! I love race expo shopping! The official merchandise area was really hectic so I wasn’t keen to stay and browse. Check out had a line but it was very organized, and we were all done with official merchandise by about 11. 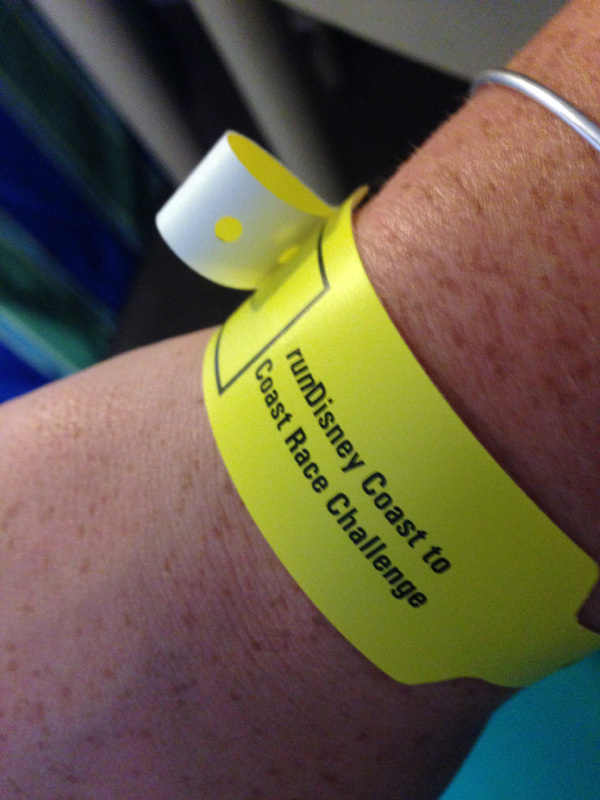 We then went back down and I picked up my packet and Coast to Coast wristband (YAY! ), and I was then directed to get my photo taken for my Coast to Coast medal. The best bracelet I have ever been given! The Coast to Coast wristband! The lines at packet pick up were super short and I was in line for less than a minute. We then went back up to the expo to pick up my shirt and I picked up a couple more things: a Sparkleskirt, a #teamsparkle visor and some GUs. Even though it was a lot of going backwards and forwards, getting the official merchandise first was a good choice for me, because I was desperate for the ‘I smashed the Half’ shirt. If you weren’t too fussed about merch you could probably do the expo in a much more organised fashion. 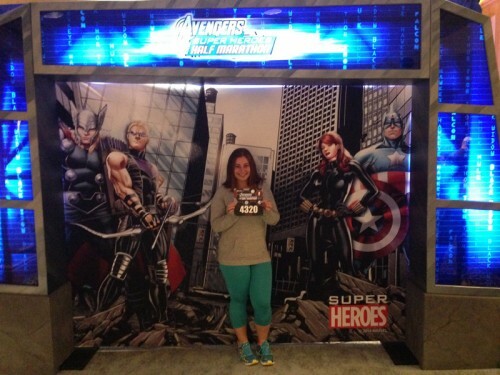 The cute Avengers background at the expo was the perfect photo opportunity! We had a relaxing day on Friday after the expo and chilled at the hotel pool, and on Saturday we headed to the park early and returned to the hotel around 4. I had the plan to go for a quick swim and spa to try and loosen up, and get an early night around 8:30. I fell asleep at 8:30, but woke up an hour later and couldn’t get back to sleep until past midnight. When the alarm went off at 3:30 I was sleepy but excited. 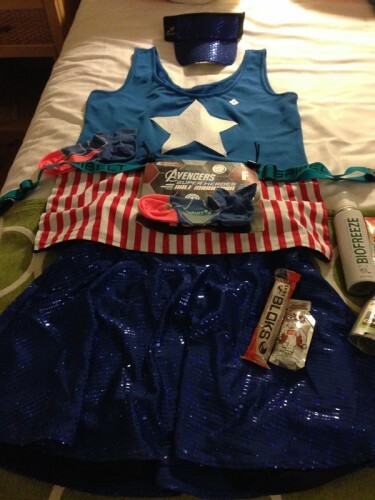 I got dressed, having laid out all my clothes the night before and left the hotel around 4. I think I saw about 3000 Captain Americas racing! 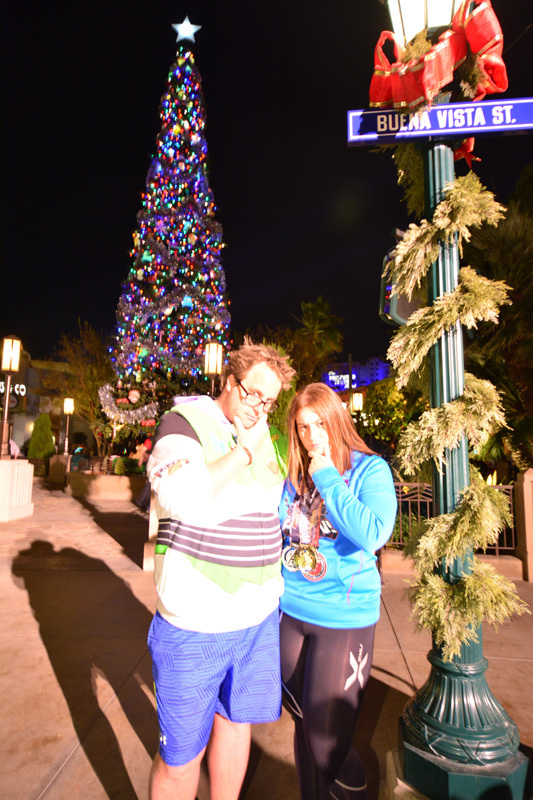 The first 3 miles through Disney property were amazing. Lots of crowd support, lots going on and lots of character stops. 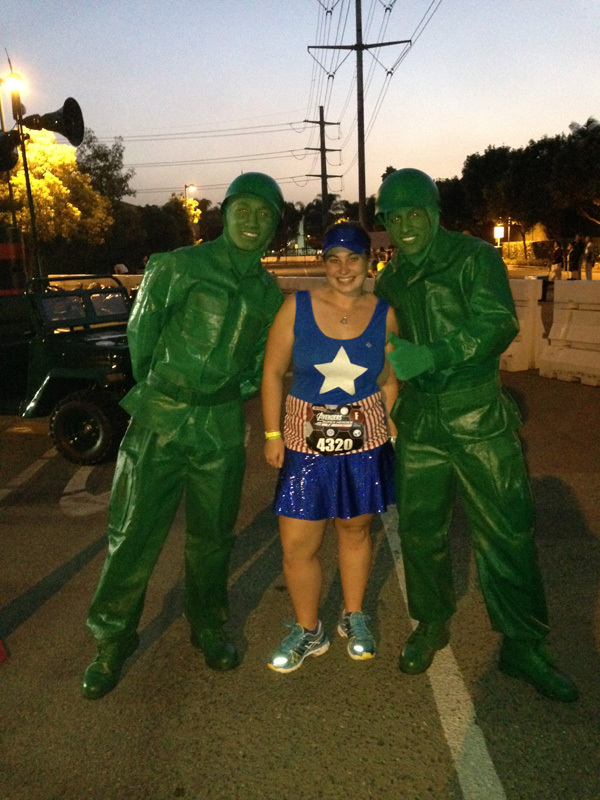 I stopped for a quick photo with the Green Army men, plus a photo with Mickey and Minnie on Main Street, and a photo out the front of Disneyland in front of the station. These lines were all quite short, so I could justify waiting in them. The lines for the Avengers characters were a different story. 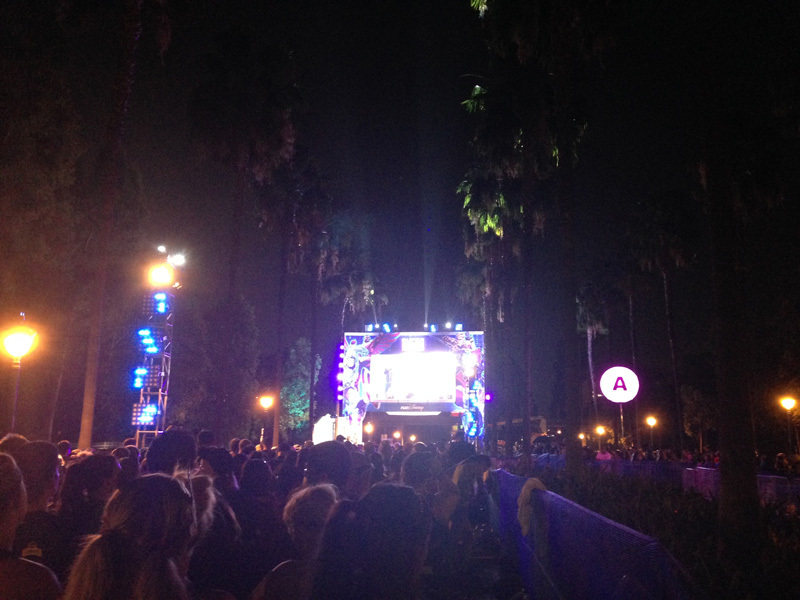 Hawkeye, Black Widow and Captain America were all on course, but with such long lines (approx. 50 people) I couldn’t wait. I am not a 16min/mile runner, so I have some leeway for photo stops, but I couldn’t risk stopping for those photos so early in the race, with no idea exactly how long the lines would take. After we left Disney property it was the end of the photo opportunities with lines, so in retrospect I probably could have waited in line, but I didn’t know that until later. Miles 3-8 through Anaheim were a little boring to be honest. While there were school bands and cheerleaders out along the way, there were also large stretches of nothing. The wind was brutal and there were points of the races were I couldn’t even look where I was going as the wind was blowing so much dirt into my eyes. I really struggled at this point of the race. 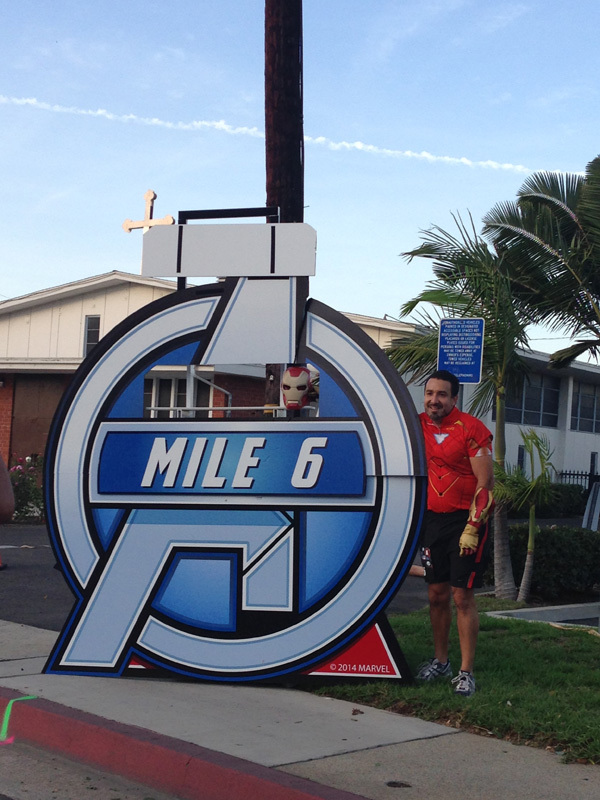 Lots of the mile markers had been blown over and many were missing clocks or the Avengers artwork. 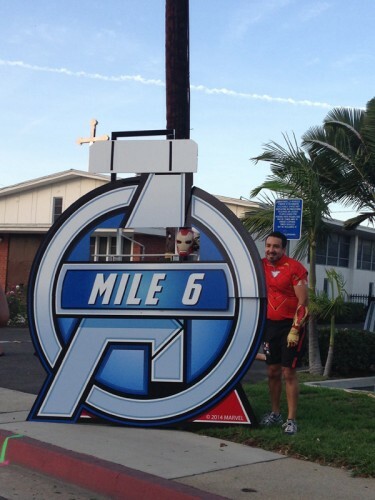 Mile 6 marker missing its clock. Funnily enough this was one of the less destroyed mile markers! It wasn’t until I saw Angel Stadium that my morale picked up a little. 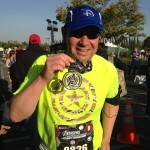 Running around Angel Stadium was the fastest part of the course for me, there was lots to keep me distracted, lots of people cheering and I knew I was in the home stretch. 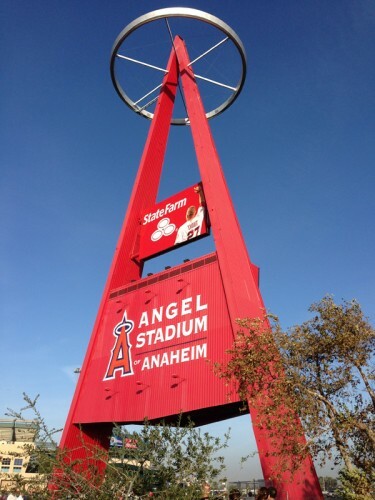 Arriving at Angel Stadium I knew I was almost there! 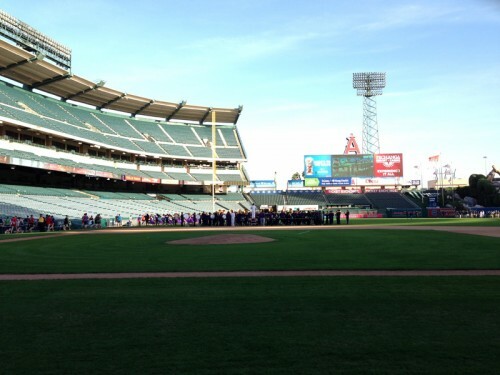 Just past Angel Stadium there was a line of Service men and women and I high-fived as many as I could. 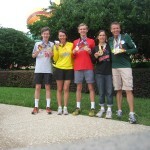 I powered through the last few miles and I was relieved when we finally stepped back onto Disney property. I think I was told I had 1 mile to go for about 2.5 miles. At this point some of the mile markers had completely disappeared, and even though I was wearing my Garmin, it had been over by about 500m from the 6 mile mark, and then I had lost reception going under some bridges, so I had no idea how accurate it was. 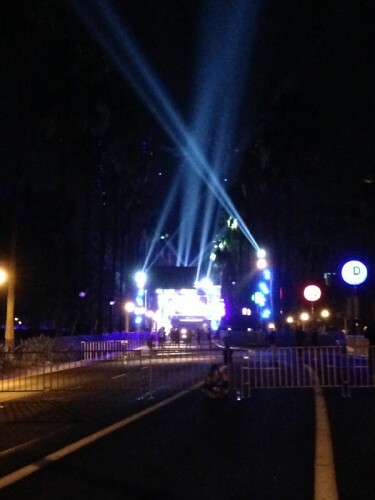 When I ran past Disneyland Hotel I knew I was almost there. I picked it up a notch and sprinted towards the finish line. I was so relieved to have crossed the finish line. It had been a really hard race for me. I was directed to the Coast to Coast tent, where they looked up my bib number (cross checked me with my photo I presume) and I was handed my medal. They had 3 people on computers at the Coast to Coast tent, and although it would probably depend on when you finished, I personally didn’t have to wait at all. I walked up and was checked straight away. After I put on my medal, I stopped for lots of photos, got my food and headed back to the hotel to relax. After 2 weeks, 2 half marathons and 2 coasts I was ready to relax. 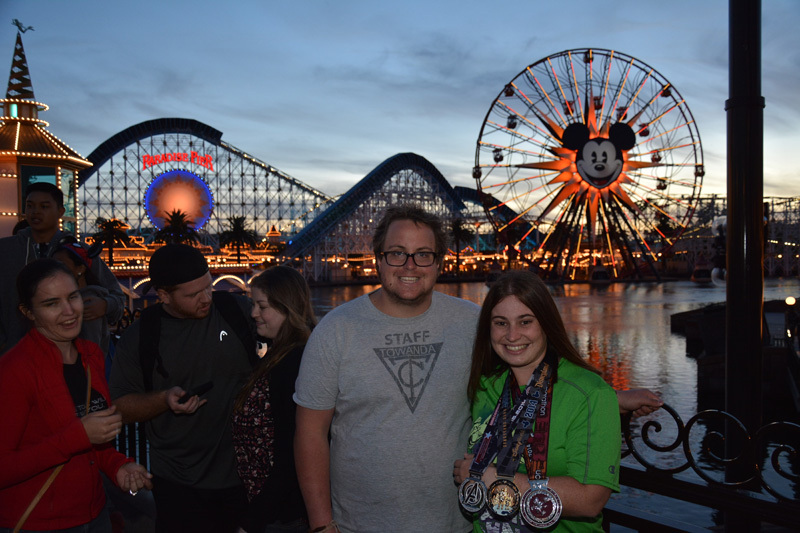 I headed to the parks later in the afternoon (after a shower and much needed nap) and showed off all 3 medals! I love the way cast members just come up to and congratulate you, it makes it such a special day. Showing off all my medals! I had an absolute blast running Disney and would recommend it to everyone. With the right training and a positive mindset any one can complete a half marathon. 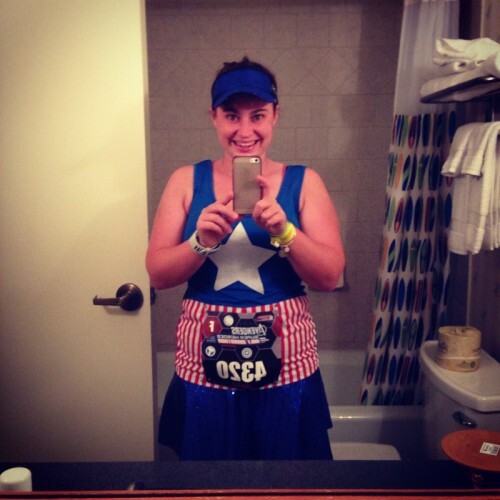 Thanks for reading, and hopefully I will see you at Marathon weekend (I’ll be doing Dopey)! Congratulations Ashleigh and we can’t wait to hear all about Dopey!! !